November 23rd." Just because he died young, does not mean his birthday ceases to exist for those of us who remain. him.” Kaitlyn, Kyle and Jack adopt our memories and make them their own as they cherish the only relationship they will have with their Uncle Scott, this side of eternity. win their final game of the Selma Turkey Shoot tournament. Kyle’s commentary on their win: “I really kept my head in the game!” Pretty impressive for a six year old! Kyle loves to play goalie, following in his Uncle Scott’s footsteps. No, that’s not much. But as one who has walked this road of grief for almost 13 years I have learned many things about experiencing peace with loss. Perhaps the most valuable aspect of my griefwork is that I have not let go of the relationship I have with Scott. 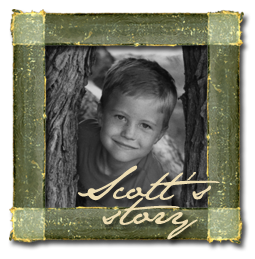 I am Scott’s mom – I am, I was, and I always will be. Scott is my sixteen-year-old son. Although “that’s not much,” I have many memories. The reality of Scott’s absence is heartbreaking at times. The solace I find is in the continued relationship I have with him. I know he is not here – I don’t “talk” to him or “see” him just around the corner. I have transformed our relationship from one of presence to one of memory. Scott is a part of me, and even though I must wait to physically hold him once again, I treasure the memories deep within that keep the relationship with my son precious and real. to know the loved one you so dearly miss, especially at these family times. I know the stories may bring tears to your eyes, but I firmly believe they will be a comfort to your soul.